A new short in Aston Martin by George Soros' fund emerged. It is a 0.52% big short (about £20 million) that has been placed on 2018-11-08. According to our records, this is the only short position >0.5% ("big short") by SFM UK Management in EU's Auto and Trucks Manufacturers Sector, out of their 18 currently active big EU shorts. 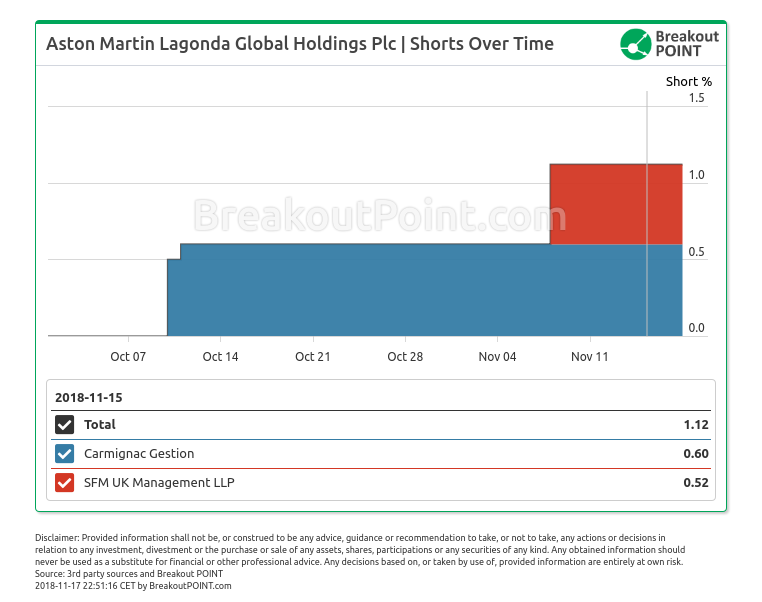 Except for Soros' fund, another hedge fund holds a big short in Aston Martin. This is Carmignac Gestion with a 0.6% short. More on these shorts can be read in The Telegraph's piece here that also mentions Breakout Point. Aston Martin is not the only luxury car maker that has been subject of intensive short selling around their IPO. Another example is Ferrari that had an IPO in Oct’15. Interestingly soon after IPO a well-known fund, Lone Pine Capital, built a short that peaked in March 2016 to 1.13%. Adage Capital, FIL Fund and D.E. Shaw also shorted Ferrari around IPO and the stock indeed went down in the first months following IPO. However, all big shorts were cut and the stock later went as much as 300% up since IPO. Two famous quant funds currently hold a big short in Ferrari (market cap about $27 billion): AQR Capital 0.8% and D.E. Shaw 0.59%. Both of these short selling positions emerged in 2018. 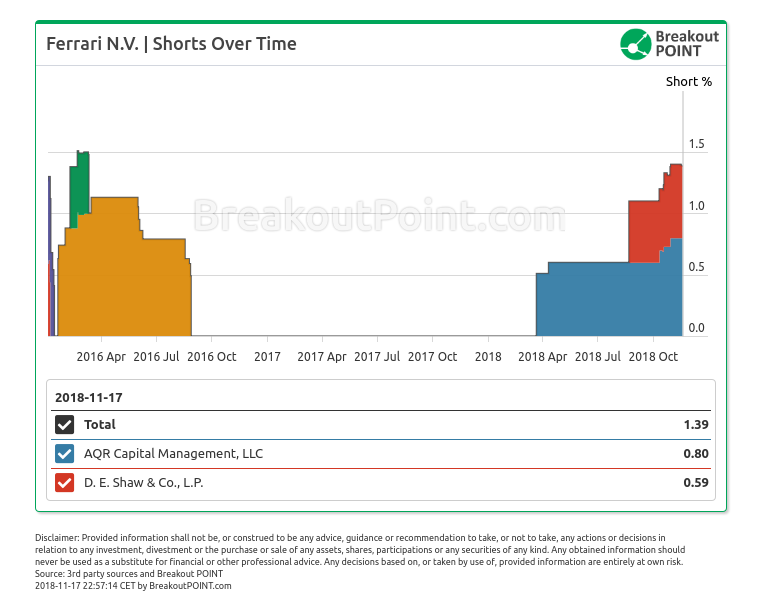 Beyond big shorts in Ferrari and Aston Martin, our auto manufacturer's short selling records show that a 0.88% short in Peugeot is held by Lansdowne Partners, and a 0.51% short in Renault is held by Merian Global Investors.